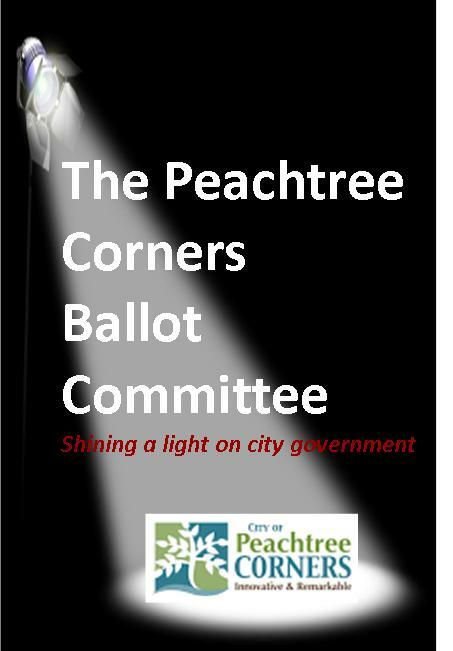 There will be a special election on November 8th to decide whether or not to make Peachtree Corners a city. If approved, The City of Peachtree Corners would be the largest of Gwinnett County’s 16 cities with approx. 38,000 residents. The borders of the city would extend from Winters Chapel Rd in the south to Duluth in the north and from Buford Hwy. in the east to the Chattahoochee River in the west. The city will be funded by up to a 1 mil increase in your property taxes ($120/ yr on a $300,000 house). There will be a corresponding increase in your ad valorem taxes, meaning the tags for your cars, motorcycles, boats, RVs, trailers, etc. will be more expensive. The city will also collect franchise fees on utilities such as telephone, cable tv, natural gas and electricity. The city only plans to offer three services: zoning, code enforcement and trash service. The city will need to establish a municipal court in order to levy and collect fines for zoning and code violations. The city can issue bonds and incur debt to build a city hall. The city can supply cars to employees and fund their retirement accounts. Trash service will still be billed separately on your property taxes, as it is now. If you don’t currently buy the optional ‘lawn trash’ service from your hauler, the city’s plan will not save you any money. The city doesn’t even have a trash plan, just a hope they can negotiate a better deal. You can’t be annexed unless you petition or vote to be annexed. In some cases, you must petition AND vote. These Quick Facts will soon be available in a brochure. Email votenocity@yahoo.com to order brochures to distribute to your friends and neighbors. In the current debate over cityhood for Peachtree Corners, much has been said and written on the matter of annexation. Some have declared, apparently with omnipotent knowledge, that if we don’t incorporate we WILL be annexed. Others have hysterically claimed that we will be ‘gobbled up’ by one or more of our neighboring cities and Peachtree Corners would ‘cease to exist’. 1. Local Legislation Method: the General Assembly can amend a city’s charter and annex land into the city. But if the area is more than 50% residential, or the population exceeds 500 people, the annexation must be approved by referendum. 2. 100 Percent Method: must be initiated by the ‘written and signed applications of all the owners of land’ proposed to be annexed. 3. 60 Percent Method: requires written and signed applications from at least 60% of the voters AND the owners of at least 60% of the land. 4. Resolution and Referendum Method: by resolution of the annexing city AND referendum of the voters in the area to be annexed. 5. Annexation of Unincorporated Islands: only applies to areas of unincorporated land surrounded by an existing municipality. There are additional qualifications to each of these methods regarding the amount of contiguous borders, crossing publicly owned lands, crossing rivers, etc, that are more technical than the needs of this discussion. If you would like to read more legalese on the subject check the resources are of our Blog. Bottom line- don’t let the proponents of cityhood scare you into believing that you will annexed into Norcross (or Duluth, Berkeley Lake, Johns Creek or Dunwoody) against your will. You will get the chance to vote on any such annexation.